Legacy is one thing: history is another. 2012 will be the third Olympic torch relay to go through the UK, and each one has its own story and context. 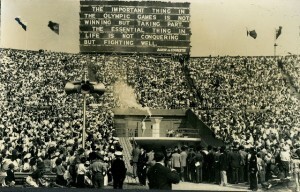 The first was not in 1908, when London held its first Olympic Games, but in 1948. 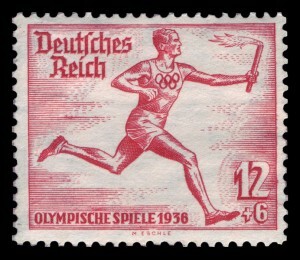 The torch relay was created by the organisers of the Berlin Olympics in 1936 as a way of stressing Nazi Germany’s love of classical antiquity. A flame was lit in Olympia from the rays of the sun, and then a relay team of runners carried it from Greece to Berlin. Leni Riefenstahl included spectacular footage of it in her film Olympia, and the idea caught on. So when London hosted the first post-Berlin Olympic Games in 1948, the planners had to deal with this interesting legacy. They decided to keep the torch relay, and to hold it as a celebration of peace. Easier said than done: the original route had to be changed because of the Greek Civil War. The final route went through Italy, Switzerland, France, Luxembourg, Belgium, and France again, and then from Dover to Wembley via Canterbury, Guildford, and Windsor. A second relay then took the flame from Wembley to Torquay for the sailing events. This, then, was a relay of reconciliation after the war – seen most obviously in the inclusion of Italy. It was a symbolic act which served to reclaim the Olympic Games from any lingering vestiges of what the Nazis had done to them. It also served to promote the Games, with huge crowds turning out to watch the relay go by. Britain’s second Olympic torch relay was less comfortable. For 2008, the organisers of the Beijing Olympic Games decided to send the torch around the world, and not just on a direct line from Greece to China. This presented opponents of China’s government – human rights campaigners, pro-Tibet activists and others – with the chance to protest in ways that would not have been possible if the relay had been a purely Chinese affair. In Britain, the torch made a brief but notorious appearance in a 30 mile relay from Wembley Stadium (home of the 1948 Olympic Games) to the O2 Arena in east London, close to the 2012 Olympic Park. For most of us, the abiding memories are not of hope and reconciliation, but of a series of often uncomfortable runners surrounded by blue track-suited Chinese security men running past protesters. Here was a torch relay that was supposed to be a propaganda coup for a dictatorship, but ended up creating far more publicity for the dissidents and opponents of that regime. Beijing’s official website, incidentally, still refers to the relay as a ‘four-month-long Journey of Harmony’. I’m not sure if many Londoners remember it that way. And so to 2012. This will be the most inclusive torch relay yet, involving 8,000 runners, many of whom are being nominated for their inspirational stories and community roles. It will take in Northern Ireland even though no Olympic sports will happen there, as well as England, Scotland, and Wales. This is the torch relay of the era of devolution and equal opportunities. Each of these torch relays tells a story. Just as the torches are designed anew for every Olympic Games, so the meanings that the planners attach to the relay itself change over time. The stories are not always heart-warming, as witness the propaganda aims of two dictatorships in this history, but they are certainly worth studying.